"For three men the Civil War wasn't hell. It was practice." 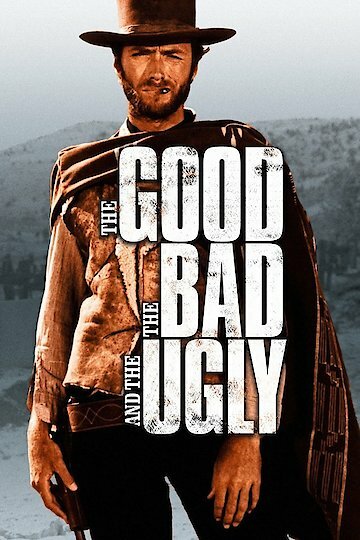 The Good the Bad and the Ugly is a western film that came out in the year 1966. It is the third part of the Man with No Name Trilogy directed by Sergio Leone. The movie is about three men who are looking to find $200,000 worth of gold during the American Civil War. Three bounty hunters are looking to find and murder a bandit. They find the location and storm into a building, however they are shot down with only one surviving. The bandit escapes. Then there is a bounty hunter named Angel Eyes who comes to the home of a man. He is looking to get paid a hefty sum of money and murders the man and most of his family. Angel Eyes is looking for a Civil War veteran named Bill Carson. Later on the bandit known as Tuco Ramirez is surrounded by three bounty hunters who are looking to capture him. Suddenly a mysterious man known as Blondie approaches them and kills the bounty hunters. Tuco is thrilled that he saved him but Blondie turns him in. However, Blondie gets him out of captivity by shooting ropes to get Tuco released. They do this a couple of times and split the money. Unfortunately, Tuco wants more of the share and Blondie turns it down. He then leaves Tuco out in the middle of the wilderness and leaves. Shortly after this, Tuco finds Blondie and captures him. He has Blondie walk through the heat and the desert and as a result Blondie collapses due to heat stroke. Fortunately for Blondie he knows the location of the buried gold and then Tuco decides to save his life by getting him medical care. Over the course of the film, Blondie and Tuco are captured by Union soldiers but escape this captivity. They then eventually find the buried gold after a Civil War battle. Angel Eyes meets with them and they have a final duel. Blondie murders Angel Eyes and decides to split the gold with Tuco. He ties Tuco up and rides away. The Good, the Bad and the Ugly is currently available to watch and stream, download, buy on demand at Amazon Prime, Starz, Amazon, Vudu, iTunes, YouTube VOD online.